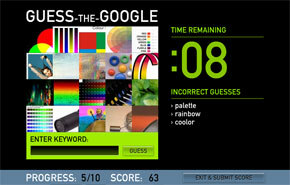 A nice game created by Grant Robinson: guess the Google. The idea of the game is simple: a set of pictures is given, taken from the Google image service. The pictures are colated and the payer has to guess what terms have been used to return that set of pictures. It is a lot of fun if you are a heavy user of web search applications. Prove that you are a pro playing this game!